Modern life would be almost impossible without the large-scale warehouse and distribution centres which provide us with everything from food to spare parts. Increasingly automated, these centres require robust racking systems which can withstand daily knocks and bumps from packages, forklifts, and robotic systems in order to keep us supplied with our daily necessities well into the future. Racking systems have traditionally been made with standard structural steel grades. However, advanced high strength steel grades from ArcelorMittal Europe – Flat Products are helping distribution centre owners to develop lightweight, robust and durable racking systems with improved resistance to the impacts which inevitably occur during daily use. High strength low alloy (HSLA) grades such as Amstrong® (AHSS) and Amstrong® Ultra (UHSS) are already being utilised to create low maintenance racking systems which are very cost effective over their entire lifetime. When treated with a high quality metallic coating such as Magnelis® from ArcelorMittal, the life of the racking system is extended even further. A racking system made with Amstrong® or Amstrong® Ultra grades can cope with significantly heavier loads than structural steels of the same thickness. For example, replacing the standard S235 JR grade with the same thickness of the UHSS Amstrong® grade 700MC can double the load-bearing capacity of the structure. All calculations were made according to F.E.M. guidelines as well as EN mandatory standards. If load weight is not an issue, the thickness of the grade can be reduced, resulting in a lighter and more cost-effective structure. The benefits of using AHSS and UHSS in industrial racking systems (estimates based on five-tonne coil). 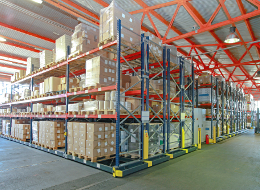 Lighter weight is also beneficial for manufacturers of racking systems. As well as speeding up the assembly process, light weight translates into lower transportation costs for finished products. 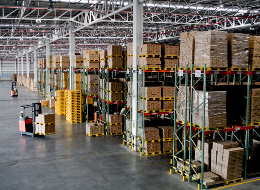 Forklift truck impacts result in significant maintenance costs for racking system owners. Each collision, even a small one, has an impact on the load-bearing capacity of the system. 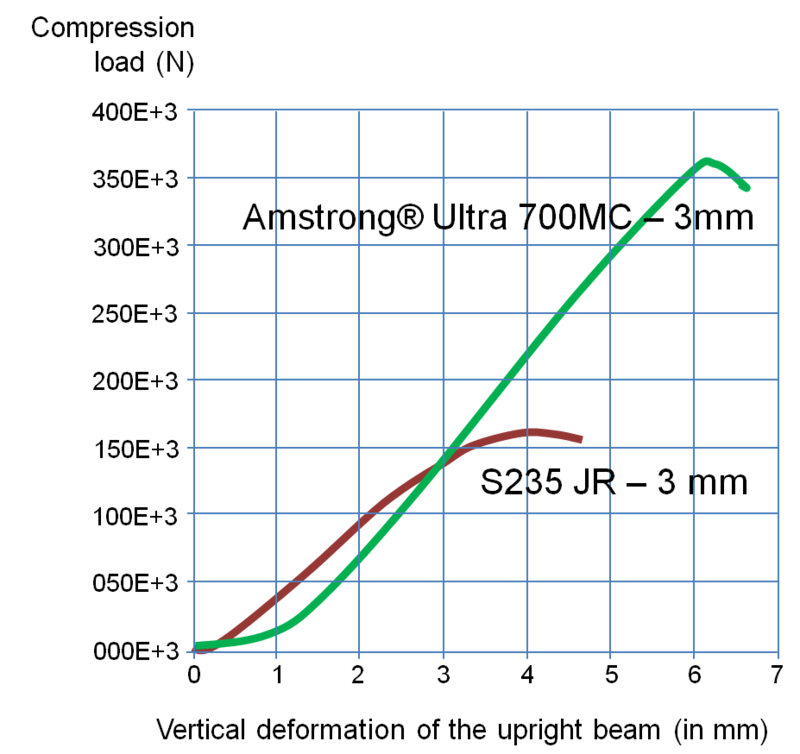 Reoccurring minor impacts can progressively decrease the resistance of the structure to the point where it collapses completely. This has safety implications for warehouse staff and results in costly maintenance, and damage to the goods being stored. The risk of collapse is significantly reduced when AHSS or UHSS are used. The higher strength of these grades can help to preserve initial load bearing capacity even after impact. As well as being safer, maintenance is reduced. The cutting force needed to punch Amstrong® Ultra 700MC is similar to the one needed for the S235JR due to the reduction thickness reduction to obtain the same technical performance of the global racking system. This means the same tools and parameters can be used. Furthermore, our tests have proven a much smaller burr height in the case of Amstrong® Ultra 700MC compared to S235JR, which translates in an improved edge quality and lower risk of injuries. In terms of roll-forming, S235JR – 3 mm requires 15 roll forming stands while Amstrong® Ultra 700MC in 3mm requires only 13 roll forming stands thanks to its higher elastic limit, meaning an efficiency gain of 15%. With our world-leading R&D teams and co-engineering approach, ArcelorMittal Europe – Flat Products can help manufacturers to design robust and cost-effective racking systems. ArcelorMittal’s Global R&D teams can even assess existing racking system designs using numerical simulations and mechanical testing of components.